SW Florida real estate market sales numbers for July 2014 were just released and as expected median and average home prices dropped from the previous month. They always do this time of year as the higher seasonal sales occur in the first half of the year. This does not mean prices are falling, rather it means the types of properties that sell changes in the 2nd half of the year which affects the numbers. In fact, median sale price numbers are up 10.4% over last year. 2014 numbers came in at $179,900, up from $163,000 last year. 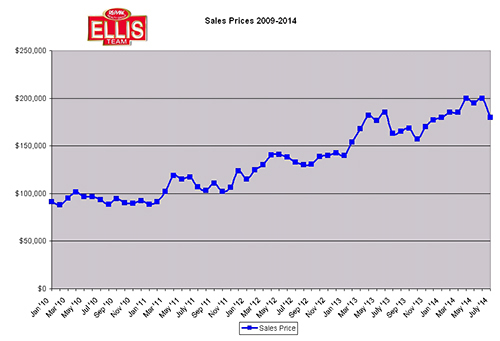 Average sales price numbers rose 3.7% from last year. July 2014 numbers came in at $254,012 versus $244,852 July 2013. We noticed two price ranges that really stood out for sales gains. The $300,000-$399,999 price range saw a 23.5% gain in sales in July over last year. This wasn’t the largest range to gain though. The $600,000-$999,999 price range saw a 48.5% rise in home sales in July, so there is strength in that price range right now. The $250,000-$299,000 was flat, but that is more attributable to the fact there isn’t much inventory in that range. If there was more inventory it would sell. Homes in that price range have graduated up to the $300k+ range and thus we’re seeing more sales. Homes tend to graduate in a rising market. Remember back in 2008 and 2009 when we had lots of sales below $100,000. You won’t see that today as very little is available in that range due to rising prices. The number of homes closed also fell in July as it usually does. 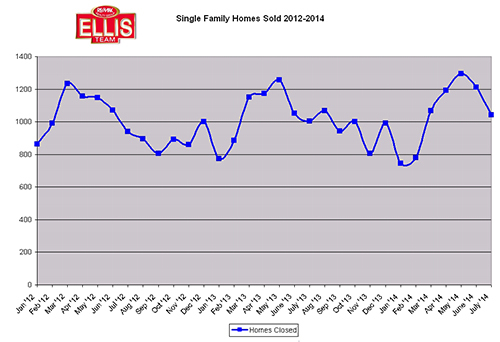 In June single family home sales were 1,213 and in July they fell to 1,042. This was however a 3.7% increase from sales levels last year. Again, as we reported several months back, we were seeing slightly elevated inventory levels and now we’re seeing slightly elevated sales numbers. If we had more inventory we’d be selling more homes. More inventory is on its way if you know where to find it. Builders are pumping homes out of the ground at an increasing pace because prices have risen which has allowed them to do so. This wasn’t the case a few years ago. The top builders have been making presentations to Realtor offices so the top agents should have a pretty good grasp of where the inventory is. Builders have been saving the day in some cases as buyers just can’t always find what they’re looking for with existing inventory. There is some inventory that is available but if the seller prices it too high buyers sit on the sidelines or move over to new construction. Just because it’s a seller’s market shouldn’t be an excuse to overprice your home. No matter the market, the buyer has choices, and if you overprice your home you either help sell your neighbors home or a new construction home. You can get an idea of what your home might be worth on our website at www.TopAgent.com Just click on the Find Out What Your Home is Worth tab. You can also search the MLS to look for a home, or see what your competition is. Either way it pays to be educated on the market if you’re looking to buy or sell. There’s no substitute for talking with an expert though if you’re seriously considering making a move. Computers are useful tools, but a knowledgeable expert can guide you on things like financing, occupancy, zoning, insurance, inspections, and many other issues. Feel free to call our team at 239-489-4042 and let us help make your move a reality. Good luck and Happy House Hunting! Posted in Cape Coral Real Estate, Fort Myers Real Estate, Southwest Florida Real Estate.Tagged SW Florida real estate Market Sales Numbers.